Most cats enjoy interacting with their owner and playing is a great way to develop the bond between you and your pet. Play for a kitten, like any other young animal, is essential for its development to maturity and for the majority of adult cats, it is a pleasurable part of domestic life. As a cat ages, its mobility and energy may lessen but gentle games can still be enjoyed by both cat and owner. Owners’ involvement in play can range from a simple game of ball to focused training (involving ‘clicker’ rewards) over a period of months. Much will depend on the nature of the cat and the time you wish to devote to your pet. Cats which never go outside will need plenty of stimulation and play, particularly when young, to prevent them becoming bored. The owner of such a cat needs to be aware of their responsibility to ensure that the cat’s mental needs, as well as it physical ones, are met. A cat which has access to the great outdoors will find plenty of interest – walls and trees to climb, prey to stalk, leaves to chase and possibly other feline company. Cats vary in their motivation to play but all cats, if provided with the right opportunity, will play and benefit from the opportunity to do so, no matter what age. Understanding the specific likes and dislikes of your own individual will enable you to provide the best possible opportunities for play. Your cat’s receptivity to play will depend on its routines and natural activity rhythms. Toys can appeal to all the feline senses – sight, sound, scent, touch and taste. Movement is a great stimulus and most toys are designed to be used actively in one way or another. Gentle noise (for example, a tinkling bell firmly concealed in a ball) may attract, but some cats will be alarmed by more strident noises. Catnip (dried catmint plant) rubbed on a plastic toy or secreted within a stuffed toy is of particular importance for blind cats and will appeal to the majority. Some cat toys feature different fabrics which encourage cats to rake their claws or rub their necks. 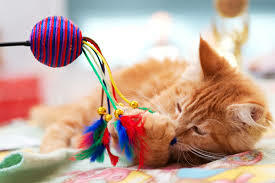 Establishing what stimulates your cat is based on trial and error, although some commercially available toys have majority appeal, such as those that contain high quality dried catnip (using the dried flowers and leaves of the catmint plant only), fishing rod toys with feathers on the end, small objects on wire that move erratically and small, fur mice. Even simple toys, such as a ping pong ball, can provide hours of fun and exercise. The ball is light enough not to do any damage around the house and the right size for a small paw to bat. For example, if you have stairs in your home, throw the ball up to encourage your cat to chase it or drop it gently from the top so that your cat sees it bounce from step to step. Even everyday household rubbish, such as screwed up balls of paper, sweet wrappers, string and corks can be transformed into exciting toys that can be chased or tossed from paw to paw. Play explores all parts of the predatory sequence: search, stalk, chase, pounce, catch and manipulate. Further research is required to establish whether or not the order and completeness of the sequence is important. 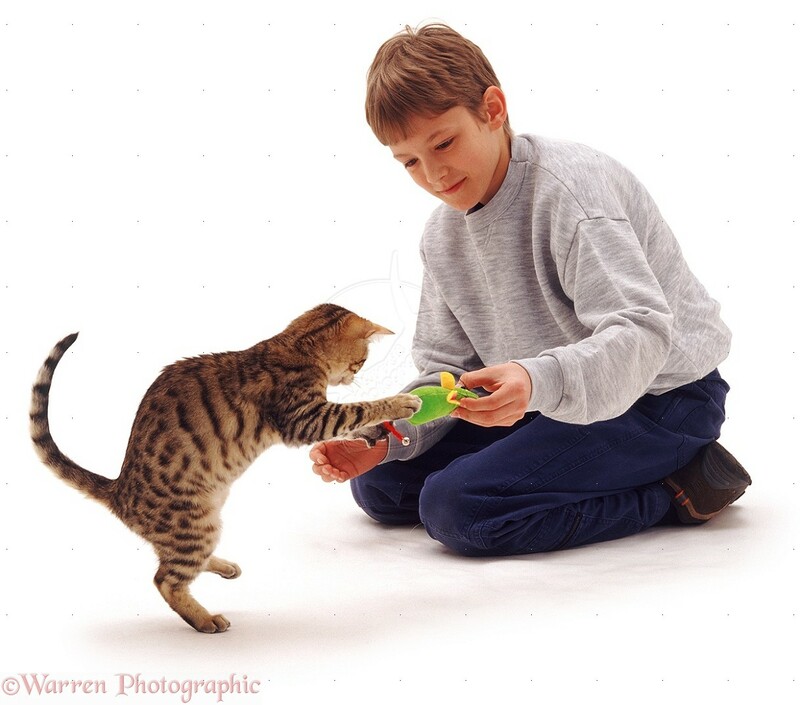 It can be observed however that some games/toys can cause frustration if the pounce/catch parts of the sequence are absent, for example, laser pointers, so it is advisable, until proven otherwise, to follow the sequence and mimic the natural circumstances as closely as possible, for example play in short bursts of activity before feeding times and end the game on a positive note when the cat catches the toy. It may be possible to identify, particularly if your cat has a high motivation to play, a particularly powerful toy that promotes an instant response every time. This toy should be used randomly to maintain its power. Cats are naturally neophilic (excited by novelty) so toys left out will soon lose their appeal. All toys should therefore be rotated randomly and kept in a sealed bag when not in use. Games should be ended on a positive note before your cat gets bored; a strong signal, particularly for the enthusiastic player, that the game has stopped is essential. If your cat appears to become over-excited or over-stimulated by a particular toy, stop that activity and redirect its attention to something else. Any toys that are interactive and require your involvement should not be left out. Play should mimic natural predatory behaviour so short bursts of activity at frequent intervals would be most beneficial. If you have a kitten it is important to teach basic good manners – cats should be discouraged from scratching, clawing or biting. This may be fine when little but as its ‘weapons’ become larger and the cat stronger it can cause damage and certainly pain. 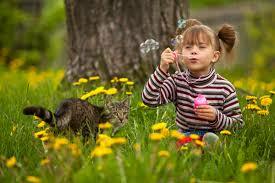 Children can be frightened by cats that do this when they haven’t learned to be gentle or to hold back in play. Small feathers or toys dangling on the end of a rod and wire or string keep your hands a safe distance from the claws. Don’t forget the oldies too; even elderly cats will enjoy the stimulation and gentle exercise of a game that is adapted to suit their level of mobility. Even if your cat lies down to play it will still be beneficial, both physically and mentally. Playtime is more complicated in multi-cat households where one cat may be more motivated to play than others or any tension is present within the group. If a cat is suffering from stress due to social conflict then play, deemed a leisure activity, will be avoided due to the need for heightened vigilance. It is therefore essential to monitor each individual in a multi-cat group and consider factoring in some time in the day to play individually in isolation. All objects should be positioned in such a way that each cat can move around it and approach from any angle. It may be necessary on occasions to intervene in social play between cats that has escalated and risks injury to either party. It is advisable not to physically intervene using arms or legs as, in a heightened state of arousal, the cats will not distinguish between you and each other and injury is inevitable. If the escalation has not progressed to physical fighting but has reached the stage of direct staring then an opportunity to break the stare, and therefore the view of each other, can be sufficient to diffuse the situation. 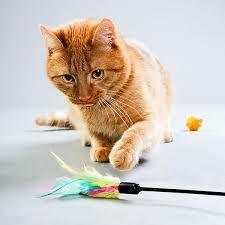 A suitable intervention would be to use distraction with a fishing rod toy, laser pointer (leading the cat towards a favourite toy) or kick toy (one large enough to be held in the forelegs and kicked with the hindlegs) to gain the cats’ attention by triggering the peripheral vision with rapid movements. If the encounter has escalated beyond this point then physical contact can be interrupted by using a blanket or towel thrown over the cats. If the problem persists it may be necessary to seek advice from your veterinarian who may refer you to an animal behaviourist or pet behaviour counsellor to assess the situation and recommend action for long-term management.